Husband and I ran away last week. We needed a break from our horrible summer and a recharge for the holidays. We went to Germany by way of Frankenmuth, Michigan. Frankenmuth is like a little Bavarian town plopped itself down in the middle of Michigan. Think of it as Brigadoon with lederhosen. We laughed. We made up silly words to Christmas carols as we ate, shopped, ate, and saw the sights. And most of the sights to see were food! 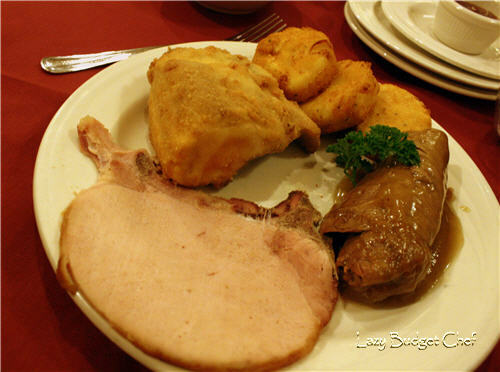 Different sides of the Zehnder family run the two famous chicken dinner restaurants in Frankenmuth, Zehnder’s of Frankenmuth and The Bavarian Inn. We arrived in Frankenmuth late afternoon. After a quick peek at some of the shops, we ate dinner at The Bavarian Inn. I later learned that a Zehnder 88 year old grandmother still cooks in the kitchen 6 days a week! The dinner portions were bigger than we were hungry for so Husband and I ordered off the lunch menu. I nibbled at the cheese and potato pancakes too. I made all gone with my sauerkraut on the side. 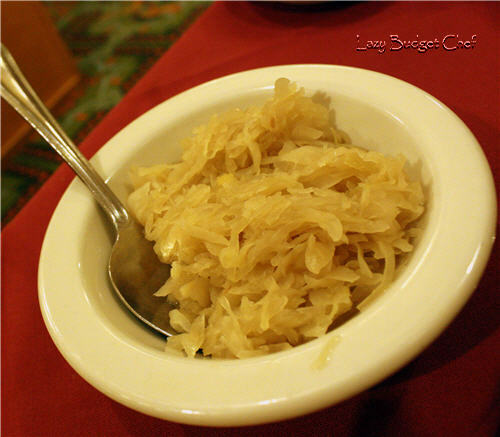 This sauerkraut was actually on the sweet side as far as sauerkrauts go. 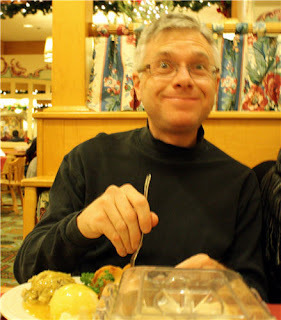 This was Husband’s first trip to Frankenmuth. He went with a Famous Frankenmuth Chicken dinner. The look of a man with a happy tummy. Either that or he's crazy. It's too close to tell. Some people go to Napa for the wine. We go to the Midwest for the craft breweries. Our first stop was Frankenmuth Brewery for an informative beer flight (four ounce taste of all the beers they brew) because they placed each pour on a menu with the name and tasting notes of each beer we tried. I didn’t drink all of these myself! 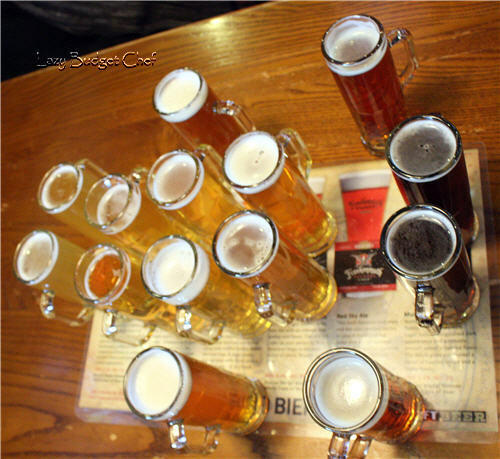 There are two flights of seven 4-ounce tastes on the table. Frankenmuth Brewery brews German style beers and according to the German purity laws. This makes their beers heavier on the hops and wheat. Overall, I am not overly fond of wheaty beers, ales, and pilsners. It is no surprise I preferred the seasonal beers with more spices and the dark Munich style Dunkel Lager because I love my porters and stouts. Husband on the other hand favored the Hefeweizen Ale. Husband is a wheat beer guy. We ate our first locally made sausage of the trip. 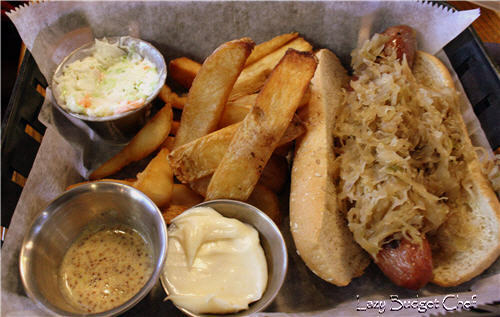 I had the bratwurst sandwich. Husband had the bratwurst dinner, which looked my meal without the roll and on a plate with mashed potatoes and a second bratwurst. 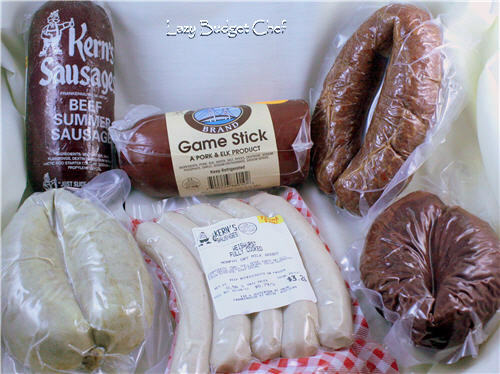 Every single sausage we ate during our trip put anything we can buy at home to shame. The mayonnaise is for my French fries. Husband thinks it is weird I like mayo on my fries instead of ketchup. I tell him I'm not being weird I’m being Danish. We toured the local brewery museum too. It told the story of the Frankenmuth breweries founded by the German settlers and how they made Malt Extract ‘for baking’ during Prohibition to keep the business in business. Of course, they went back to brewing beer after Congress appealed Prohibition. Sorry no photos. I wasn’t allowed. Our favorite craft beer of the trip is Sullivan's Black Forest Brew Haus & Grill. The Indian Pale Ale (IPA) is missing in our flights because they were out and brewing more. Sullivan's brews a few German style beers but doesn't hold themselves to the German Purity Laws so there is taste and variety in their beers. Sullivan's also brews darker beers. Husband and I declared the Red Ale, Pirate’s Porter, and Sully’s Oatmeal Stout the favorites of the flight. 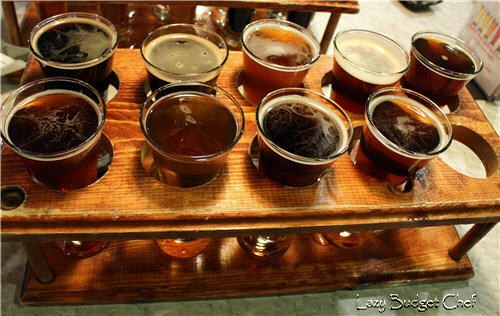 We treat a beer flight like the appetizer, drink, and dessert of our meal. I took a little break from all things German on the food side too. 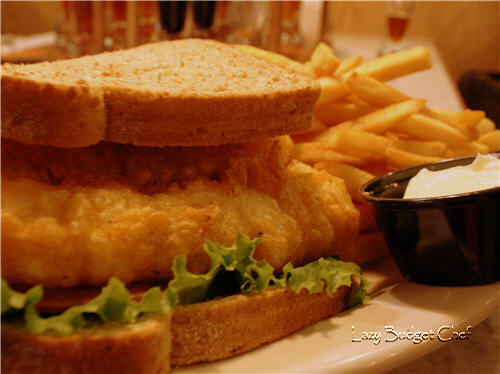 Lake Michigan fish and chips! More mayonnaise on the side for my fries and more chiding from Husband for it. Almost every other shop in downtown Frankenmuth is a handmade candy shop. We sampled and bought goodies there too. None of them made it home for me to photograph for this post. I have one little photo of handmade chocolate we tried during a wine and chocolate sampling at Wolcott Winery. 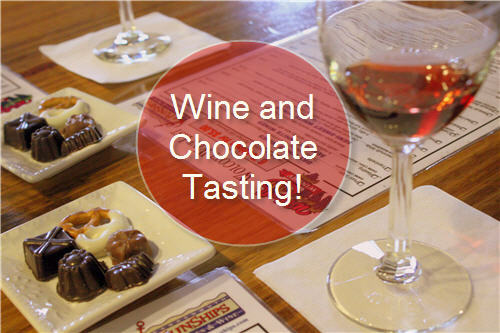 They paired their locally made wines with wonderful chocolates made right in the shop. Wolcott Winery’s blueberry and cherry dessert wines and chocolate came home with us. We allowed ourselves something we rarely do on a vacation. We spoiled ourselves a bit because neither of us could figure out a way to sneak back to any of the places we visited to buy it as a gift for the other one. We tried to take advantage of the shops in Frankenmuth and the outlet mall in Birch Run to do some Christmas shopping. Mission not really accomplished. Most of the things we saw were more impulse items like the wine glass (which is one of our old renaissance festival performer bits. We should have made and sold these glasses first! We would be hundredares by now!) 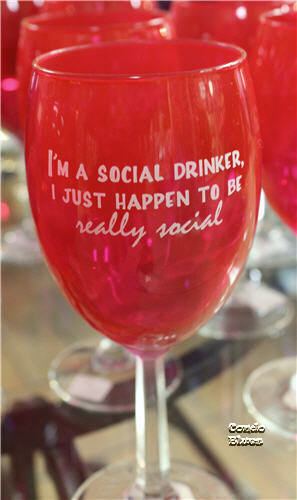 than the type of gift items we were looking for. Sorry family! No gifts from exotic Michigan for you this year. 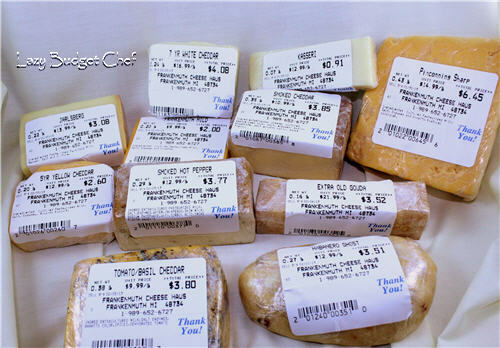 We aren’t sure how to keep the locally made food souvenirs we bought from spoiling under your Christmas tree. 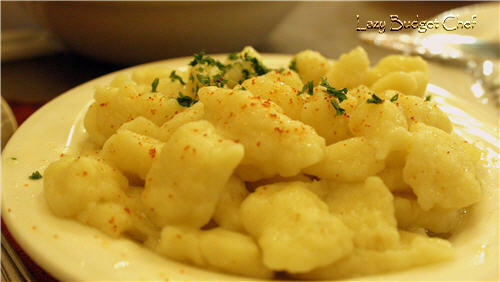 We’re forcing ourselves to eat and enjoy them in your name. Husband went a little crazy at the Cheese Haus too. Apparently, we have to have some sort of wine and cheese party in order to eat Husband’s cheese frenzy before it spoils. 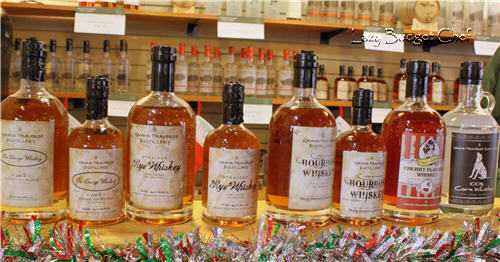 It will give us a chance to share our experience at the Grand Traverse Distillery shop. Grand Traverse Distillery makes craft vodkas and whiskeys. Craft distillery? Husband and I were intrigued. 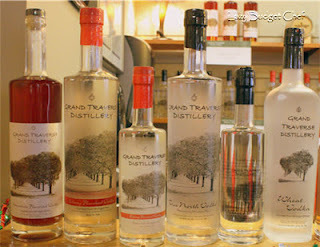 Grand Traverse Distillery’s craft vodkas are very smooth and enjoyable. I’m usually not much of a whiskey drinker but I have to say, Grand Traverse Distillery’s craft whiskey is my favorite. It is so smooth drinking it is like giving your tongue a hug, particularly the Ole George 100% Straight Rye Whiskey. Do you see that bottle of clear whiskey on the right? That is legal moonshine (corn whiskey)! We bookended our trip with a chicken lunch at Zehnder’s of Frankenmuth. 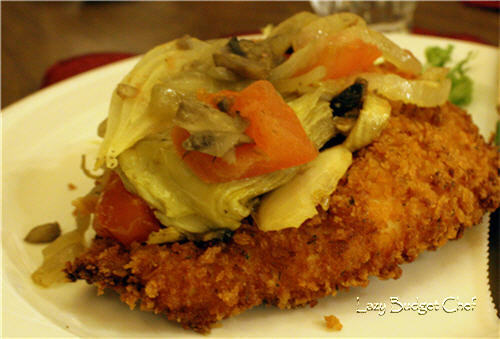 We enjoyed an updated version of chicken schnitzel topped with caramelized onions, tomatoes, and artichokes and traditional spaetzle on the side. Swoon! A little food tourism was just what we needed to relax and recharge for the holidays. Lisa, It's nearing the dinner hour and you've made me hungry! ;) Hope your visit to Frankenmuth was all you hoped it would be, and you will be able to visit again soon. 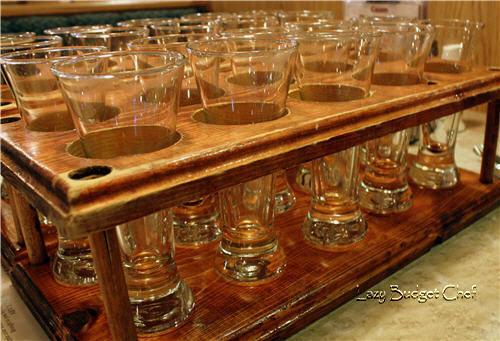 We carry a vast selection of food and beverage ornaments at Bronner's. Not as yummy as the real thing, but they look pretty on a tree. You really made the best of Frankenmuth! Sullivan's is one of our favorite places too. And I totally agree with you on the beer front. I am not a wheat beer girl either, give me a Nut Brown or a nice Oktoberfest any day! So glad I found your post on Katherine's Hop, mine is Christmas Movies! We were to Frankenmuth a couple of years ago, I can still taste that chicken dinner!! What a place! Frankenmuth is one of my favourite places in the world! We go every October!! So beautiful! Reading your post made me want to go back early!!! We always make sure we hit both restaurants and eat like crazy!!! I love Frankenmuth! We go every October! Your post makes me want to go back early! 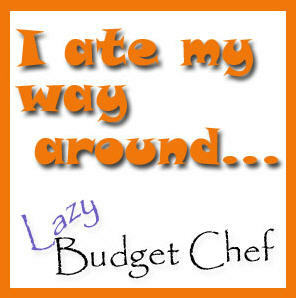 We always go to both restaurants and eat ourselves crazy!!! !